Leatherface is a fictional character in The Texas Chainsaw Massacre horror-film series. One of the first slasher-film villains, he has appeared in all six of the series' films since the release of the original, in 1974. The character wears masks made of human skin and engages in murder and cannibalism. In the series, he often uses a chainsaw and sledgehammer to slaughter his victims. He lives with a poor Southern family of fellow cannibals and serial-killers, who often behave abusively and violently towards him. The character is inspired by Wisconsin serial killer Ed Gein who, like Leatherface, wore a mask of skin. ​determined his personality. Who he wanted to be that day determined what mask he put on. So, when the Cook comes home, with Sally, Leatherface is wearing the 'Grandmother Mask' and he's wearing an apron and carrying a wooden spoon – he wants to be domestic, helpful in the kitchen. At dinner he wears a different face - the 'Pretty Woman,' which has make up." The Texas Chain Saw Massacre is a 1974 American independent horror film directed by Tobe Hooper and written collaboratively by Hooper and Kim Henkel. The film stars Marilyn Burns, Gunnar Hansen, Teri McMinn, William Vail, Edwin Neal and Paul A. Partain. While presented as a true story involving the ambush and murder of a group of friends on a road trip in rural Texas by a family of cannibals, the film is completely fictional. 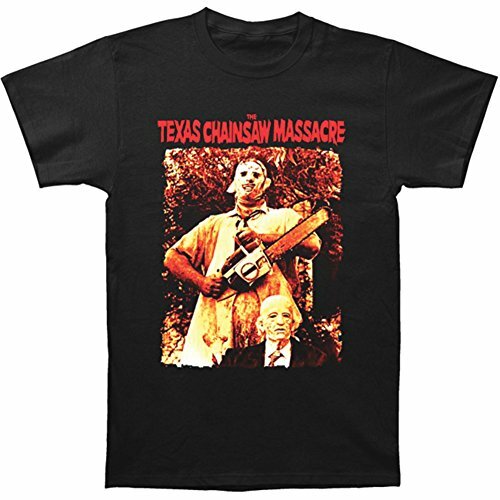 The Texas Chain Saw Massacre started the six films of The Texas Chainsaw Massacre film franchise revolving around the character of Leatherface, portrayed by Hansen in this film. 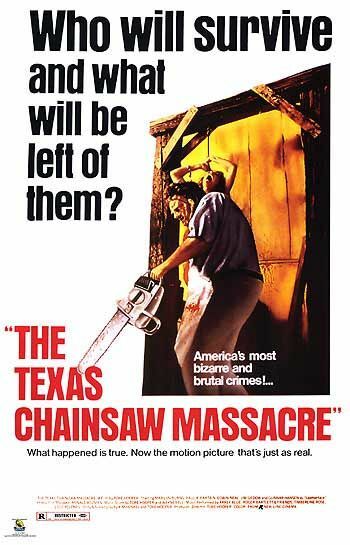 ​This is the original Texas Chainsaw Massacre film and it revolves primarily around a group of friends on a road trip in rural Texas. The purpose of the road trip is to visit the hometown of Sally and Franklin's father in order to check on their grandfather's grave after reports of grave robbing. After their van runs low on gas, the group of friends visits the childhood home of Sally and Franklin's father where they are attacked by a family of cannibalistic men, including the chainsaw-wielding Leatherface. 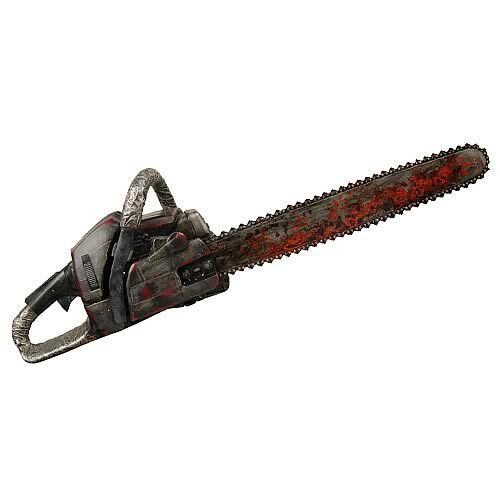 Leatherface - The Texas Chainsaw Massacre Movie Prop Peplicas, Figures, Toys and Collectibles! Discover the origins of the maniacal and merciless Leatherface and his family of cruel cannibals in the prequel to the hit remake The Texas Chainsaw Massacre. Before departing for Vietnam, two friends and their girlfriends go on a road trip. After a car accident, they are taken to a house of horror by the local sheriff and come face to face with the man who will be Leatherface. This frightfully gleeful fellow is more than willing to help... as soon as he cuts his way through this pesky wall. Then you can bring the psychotic killer into your home and (perhaps) live to tell about it. 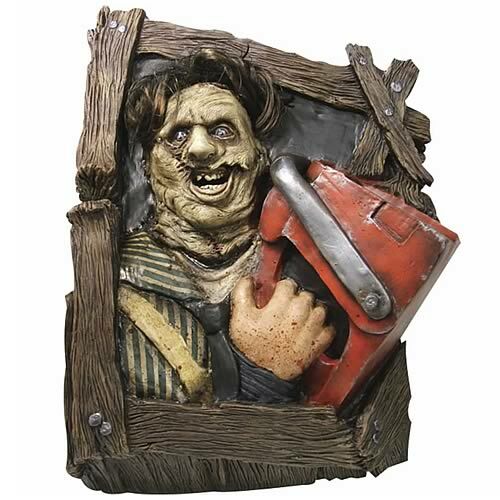 From The Texas Chainsaw Massacre, this Leatherface Wallbreaker sculpted by Rubies is almost too realistic. The alarming statue features a mangled and bloody Leatherface with his trusty chainsaw and an insane look on his face and in his eyes. It's perfect for scaring the daylights out of yourself in the middle of the night as you walk down the hall to the bathroom. So, go ahead. Go out on a limb and order it today! Measures approximately 36-inches tall x 30-inches wide x 10-inches deep. 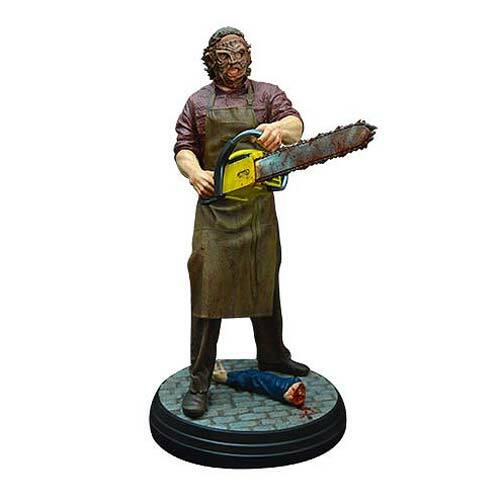 The Texas Chainsaw 3D Leatherface 1:4 Scale Statue features an image of the disfugured horror icon wielding his signature trademark bloody chainsaw and standing over a person's severed arm. This exquisite 1:4 scale polyresin statue stands an impressive 20-inches tall on the included Texas Chainsaw Massacre display base and is a limited edition of 500 pieces. Constructed from heavyweight polystone and hand-painted.